Renal cell carcinoma (see the image below) is the most common type of kidney cancer in adults. It accounts for approximately 3% of adult malignancies and 90-95% of neoplasms arising from the kidney. Renal cell carcinoma may remain clinically occult for most of its course. Only 10% of patients present with the classic triad of flank pain, hematuria, and flank mass. Surgical resection remains the only known curative treatment for localized renal cell carcinoma, and it is also used improve outcome or for palliation in metastatic disease. Targeted therapy and immunomodulatory agents are considered standard of care in patients with metastatic disease. Chemotherapy is used only occasionally, in certain tumor types. Experimental treatment approaches include vaccines and nonmyeloablative allogeneic peripheral blood stem cell transplantation. In recent years, multiple agents have been developed for systemic treatment of metastatic disease. Although the optimal treatment strategy continues to evolve, three agents that target angiogenesis (sunitinib, bevacizumab/interferon, and pazopanib) and a mammalian target of rapamycin (mTOR)–targeted therapy (temsirolimus) are approved as front-line agents. For selected patients, cabozantinib or combination therapy with nivolumab plus ipilimumab are also used as first-line treatments. Finally, high-dose interleukin-2 (IL-2) and axitinib can be used in selected patients. A number of agents are available to be used in second and subsequent lines of therapy, these include anti-angiogenic therapy (if not already used in first-line treatment), nivolumab, cabozantinib, and mTOR inhibitors. Recommendations regarding how to sequence approved agents during subsequent therapy are evolving; more work is needed. Clinical trials are currently exploring future directions, including combinations of approved agents and the optimal sequencing of these agents. Go to Clear Cell Renal Cell Carcinoma and Sarcomatoid and Rhabdoid Renal Cell Carcinoma for complete information on these topics. The tissue of origin for renal cell carcinoma (RCC) is the proximal renal tubular epithelium. Renal cancer occurs in a sporadic (nonhereditary) and a hereditary form, and both forms are associated with structural alterations of the short arm of chromosome 3 (3p). Genetic studies of the families at high risk for developing renal cancer led to the cloning of genes whose alteration results in tumor formation. These genes are either tumor suppressors (VHL, TSC) or oncogenes (MET). Renal cell carcinoma develops in nearly 40% of patients with von Hippel-Lindau disease and is a major cause of death in these patients. Deletions of chromosome 3p occur commonly in renal cell carcinoma associated with von Hippel-Lindau disease. Chromosome 3p contains several of the genes associated with kidney cancer, including BAP-1 and PBRM-1, among others. The VHL gene is mutated in a high percentage of tumors and cell lines from patients with sporadic (nonhereditary) clear cell renal carcinoma. Several kindreds with familial clear cell carcinoma have a constitutional balanced translocation between 3p and either chromosome 6 or chromosome 8. Mutations of the VHL gene result in the accumulation of hypoxia-inducible factors (HIFs) that stimulate angiogenesis through vascular endothelial growth factor (VEGF) and its receptor (VEGFR). VEGF and VEGFR are important new therapeutic targets. 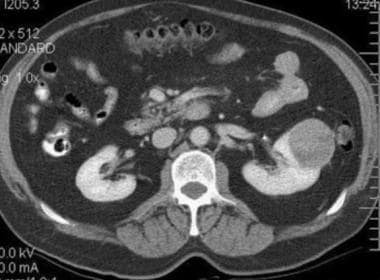 Hereditary papillary renal carcinoma is an inherited disorder with an autosomal dominant inheritance pattern; affected individuals develop bilateral, multifocal papillary renal carcinoma. Germline mutations in the tyrosine kinase domain of the MET gene have been identified. Individuals affected with familial renal oncocytoma can develop bilateral, multifocal oncocytoma or oncocytic neoplasms in the kidney. Birt-Hogg-Dube syndrome is a hereditary cutaneous syndrome. Patients with Birt-Hogg-Dube syndrome have a dominantly inherited predisposition to develop benign tumors of the hair follicle (ie, fibrofolliculomas), predominantly on the face, neck, and upper trunk, and these individuals are at risk of developing renal tumors, colonic polyps or tumors, and pulmonary cysts. Affected individuals with this inherited medical condition have an increased tendency to develop oncocytomas, benign kidney tumors that have a low malignant potential. Renal carcinoma patients diagnosed at 45 years or younger and those with family history of kidney cancer should receive genetic counseling. A number of environmental and genetic factors have been studied as possible causes for renal cell carcinoma (RCC). Cigarette smoking doubles the risk of renal cell carcinoma and contributes to as many as one third of all cases. The risk appears to increase with the amount of cigarette smoking in a dose-dependent fashion. Smoking has also been associated with advanced disease at presentation. Obesity is a risk factor, particularly in women. Increasing body weight has a linear relationship with increasing risk. Hypertension is a possible risk factor. A prospective evaluation by Cho et al concluded that longer duration of use of nonaspirin nonsteroidal anti-inflammatory drugs (NSAIDs) may increase the risk for renal cell cancer. Phenacetin-containing analgesics taken in large amounts may be associated with increased incidence of renal cell carcinoma; this agent is no longer approved for use in the United States. Patients undergoing long-term renal dialysis have an increased incidence of acquired cystic disease of the kidney, which predisposes to renal cell cancer. In renal transplant recipients, acquired renal cystic disease also predisposes to renal cell cancer. Chronic hepatitis C infection  and, according to meta-analysis of pooled data, kidney stones in males  are associated with higher incidences of kidney cancer. Genetic disorders associated with renal cell carcinoma include von Hippel-Lindau syndrome, hereditary papillary renal carcinoma, Birt-Hogg-Dube syndrome, and hereditary renal carcinoma. The genetic disease tuberous sclerosis appears to be associated with renal cell carcinoma, although the exact nature of the association is unclear. Currently, cancers of the kidney and renal pelvis are the sixth most common cancer in US men, accounting for 5% of cases, and the eighth most common in US women, accounting for 3% of cases. The American Cancer Society estimates that in 2019 there will be 73,820 cases (44,120 in males and 29,700 in females) of malignant tumors of the kidney diagnosed, with 14,770 deaths (9820 in males and 4950 in females). Renal cell carcinoma is expected to account for 80% of this incidence and mortality. In the United States, death rates from kidney and renal pelvis cancer have been falling on average 0.7% annually over 2006-2015; these cancers currently constitute the twelfth leading cause of cancer death. The 5-year survival rates initially reported by Robson in 1969 were 66% for stage I renal carcinoma, 64% for stage II, 42% for stage III, and only 11% for stage IV. [11, 12] Except for stage I, these survival statistics have remained essentially unchanged for several decades. Patients with regional lymph node involvement or extracapsular extension have a survival rate of 12-25%. Although renal vein involvement does not have a markedly negative effect on prognosis, the 5-year survival rate for patients with stage IIIB renal cell carcinoma is 18%. In patients with effective surgical removal of the renal vein or inferior vena caval thrombus, the 5-year survival rate is 25-50%. Unfortunately, 5-year survival rates for patients with stage IV disease are low (0-20%). Patients at high risk should be made aware of the early signs and symptoms of the disease, and the need for early intervention for possible cure should be stressed. For patients with early-stage disease who have undergone treatment, education about possible relapse should be provided. For patient education information, see the Cancer and Tumors Center, as well as Blood in the Urine and Renal Cell Cancer. Heng DY, Xie W, Regan MM, Warren MA, Golshayan AR, Sahi C, et al. Prognostic factors for overall survival in patients with metastatic renal cell carcinoma treated with vascular endothelial growth factor-targeted agents: results from a large, multicenter study. J Clin Oncol. 2009 Dec 1. 27 (34):5794-9. [Medline]. [Guideline] Escudier B, Porta C, Schmidinger M, Rioux-Leclercq N, Bex A, Khoo V, et al. Renal cell carcinoma: ESMO Clinical Practice Guidelines for diagnosis, treatment and follow-up. Ann Oncol. 2019 Feb 21. 27 (suppl 5):v58-v68. [Medline]. [Full Text].